Thunder comes from the sky and is absorbed by the earth. Thunder is one of the most powerful natural forces, circling, gyrating. This palgwe should be performed with this in mind. 24 Movements, 2 kicks, 8 punches, 2 keup. Ready stance (Joonbi). Left turn 90° into a left back stance (Dwitkoobi). Execute a diamond mountain middle block (Keumgang Momtong Makki). Pull the left fist under the right arm. Execute a right uppercut (Dangyo Teok Jireugi). Bring the left foot toward the right foot and assume parallel stance (Naranhi Seogi). Execute a left knife hand strike to the side, palm down (Sonnal Bakkat Chigi) pulling right fist to hip. Shift left foot to the right foot position, simultaneously, lower both fist to the left hip and focus eyes to the right. Step up right back stance (Dwitkoobi). Execute a diamond mountain middle block (Keumgang Momtong Makki). Mantaining back stance, left fist uppercut (Dangyo Teok Jireugi). Pull back right fist towards shoulder. Bring the right foot inward to assume a parallel stance (Naranhi Seogi). Face and look towards the right. Execute a right side knife hand strike, palm down (Sonnal Bakkat Chigi) Pulling left fist to hip. Move the left foot toward 12 o’clock. Assume a right back stance (Dwit Kubi). Execute a left double knife hand middle block (Sonnal Momtong Makki). Execute a right front kick (Ap Chagi). Assume a right forward stance (Ap Kubi) and execute a left pressing block and right spear hand strike (Pyeon Sonkkuet Seweo Tzireugi). Pivot counterclockwise to the rear while bringing the right hand to the belt, palm facing outward. Turn 180°into a front stance (Ap Kubi). Execute an outward hammer-fist strike (Me Jumeok Bakkat Chigi) at the completion of the turn. Advance assuming a right forward stance (Ap Kubi). Execute a right middle punch (Momtong Jireugi). Yell (Kihap). Turn counterclockwise 270° into a back stance (Dwit Kubi). Execute a diamond mountain middle block (Keumgang Momtong Makki). Bring the right fist under the left arm. Execute a right uppercut (Dangyo Teok Jireugi). Pull the left foot toward the right foot into a parallel stance (Naranhi Seogi). Execute a left knife hand side strike (Sonnal Bakkat Chigi). Slide left foot to the right foot, then slide the right foot into a left back stance (Dwit Kubi). Execute a diamond mountain middle block (Keumgang Momtong Makki). Bring the left fist under the right arm. Execute a left uppercut (Dangyo Teok Jireugi). Bring the right foot inward. Assume a parallel stance (Naranhi Seogi). Execute a right knife hand side strike (Sonnal Bakkat Chigi). Slide the right foot to the left foot then move the left foot forward into a right back stance (Dwit Kubi). Execute a left double knife hand middle block (Sonnal Momtong Makki). Execute a right front kick (Ap Chagi). Assume a right forward stance (Ap Kubi). Execute right vertical spear finger thrust (Pyeonsonkeut Seweo Tzireugi). Pivot counterclockwise to the rear, quickly retracting right hand as if escaping from a grab. Place hand to left side of head, palm in. As you retract your hand turn 360° counterclockwise, pivoting on the ball of the right foot, end in a left forward stance (Ap Kubi). Execute a left hammerfist strike (Me Jumeok Bakkat Chigi) at the completion of the turn. Turn 270° counterclockwise into a horse riding stance (Juchum Seogi). Execute a left side down block (Arae Yop Makki). Shift the left foot into a left forward stance (Ap Kubi). 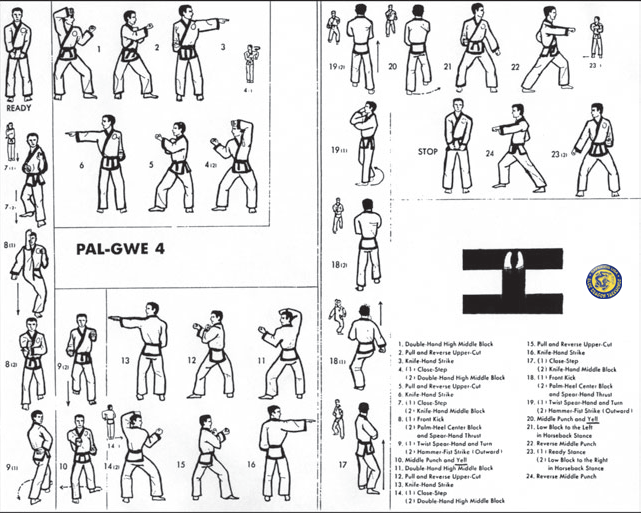 Execute a right middle punch (Momtong Jireugi). Slide the left foot into a horse riding stance (Juchumseogi). Execute a right side down block (Arae Yop Makki). Pivot the feet into a right forward stance (Ap Kubi). Execute a left middle punch (Momtong Jireugi). Ready stance (Geuman) Keep left foot fixed, move right foot toward left.